We offer transfers from Gdansk Airport to many locations in Poland and Russia. 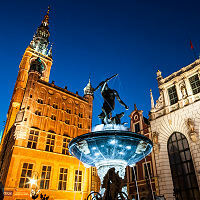 We also offer customized Gdansk transfers, please inquire with us for a quote. Total travel time for this transfer is about 25 minutes for the 10 km ride.Vehicles used for this transfer:4 passenger vehicle: 2008-2015 or newer Mer..
Total travel time for this transfer is about 40 minutes for the 21 km ride.Vehicles used for this transfer:4 passenger vehicle: 2008-2015 or newer Mer..
Total travel time for this transfer is about 120 minutes for the 115 km ride.Vehicles used for this transfer:4 passenger vehicle: 2008-2015 or newer M..
Total travel time for this transfer is about 130 minutes for the 88 km ride.Vehicles used for this transfer:4 passenger vehicle: 2008-2015 or newer Me..
Total travel time for this transfer is about 240 minutes for the 180 km ride.Vehicles used for this transfer:4 passenger vehicle: 2008-2015 or newer M..
Total travel time for this transfer is about 50 minutes for the 28 km ride.Vehicles used for this transfer:4 passenger vehicle: 2008-2015 or newer Mer..
Total travel time for this transfer is about 60 minutes for the 55 km ride.Vehicles used for this transfer:4 passenger vehicle: 2008-2015 or newer Mer..
Total travel time for this transfer is about 80 minutes for the 190 km ride.Vehicles used for this transfer:4 passenger vehicle: 2008-2015 or newer Me..
Total travel time for this transfer is about 100 minutes for the 70 km ride.Vehicles used for this transfer:4 passenger vehicle: 2008-2015 or newer Me..
Total travel time for this transfer is about 110 minutes for the 100 km ride.Vehicles used for this transfer:4 passenger vehicle: 2008-2015 or newer M..
Total travel time for this transfer is about 80 minutes for the 72 km ride.Vehicles used for this transfer:4 passenger vehicle: 2008-2015 or newer Mer..
Total travel time for this transfer is about 60 minutes for the 72 km ride.Vehicles used for this transfer:4 passenger vehicle: 2008-2015 or newer Mer..
Total travel time for this transfer is about 140 minutes for the 180 km ride.Vehicles used for this transfer:4 passenger vehicle: 2008-2015 or newer M..
Vehicles used for this transfer:4 passenger vehicle: 2008-2015 Mercedes-Benz Vito Tourer or Mercedes-Benz E-ClasseBaby seats are available free of cha..
Total travel time for this transfer is about 35 minutes for the 22 km ride.Vehicles used for this transfer:4 passenger vehicle: 2008-2015 or newer Mer..
Total travel time for this transfer is about 60 minutes for the 45 km ride.Vehicles used for this transfer:4 passenger vehicle: 2008-2015 or newer Mer..
Total travel time for this transfer is about 120 minutes for the 120 km ride.Vehicles used for this transfer:4 passenger vehicle: 2008-2015 or newer M..
Total travel time for this transfer is about 30 minutes for the 16 km ride.Vehicles used for this transfer:4 passenger vehicle: 2008-2015 or newer Mer..